The Galaxie 45TH ... meeting market demand for very large-sized sliding doors. It was in April 1997 that Installux Aluminium of France set up Installux Gulf and since then it has established itself as a well recognised and leading architectural aluminium systems supplier in the region with a reputation for excellence. “Throughout these past 20 years the company has stuck to the principle values that have driven it since its early days,” says Basim AlSaie, managing director of Installux Gulf, who says service is the essence of what company works for. AlSaie ... leading from the front. AlSaie says it is vital to be efficient in today’s fast-moving market dynamics, adding the company ensures its operations meet not only local or regional standards, but global levels as well. Today, major towers and landmark buildings across the region’s skyline bear the hallmarks of its excellence. 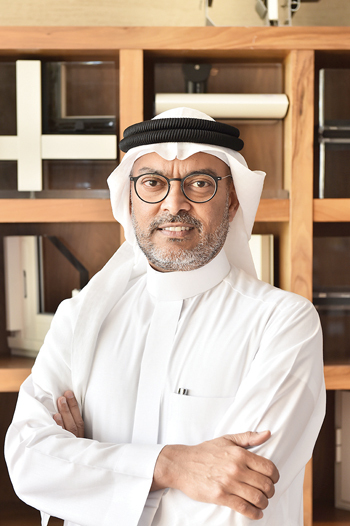 Installux Gulf has embarked on a vigorous strategy that includes launching new and innovative products, investment in its operations, and using the latest technology to further drive its service, efficiency, and productivity, according to AlSaie. During 2017, Installux introduced its new lift-and-slide systems which allow the installation of sliding doors of 3 m in height and beyond. The latest of these systems, known as the Galaxie 45TH, has the slimmest profile, modern look, and best performance in its category, he says. “The Galaxie 45TH is aimed at meeting market demand for very large-sized sliding doors. It offers the highest energy-saving ratings and performance levels in its class. The system was developed to accept high-performance glazing (double and triple), up to a maximum thickness of 45 mm and 450 kg of weight per sliding panel. “Design-wise, the system has the slimmest middle interlock of any product on the market, allowing for the creation of very tall and wide sliding doors that have very slim profiles. The design supports the current trend among leading architects who want to achieve a maximum size opening with the slimmest possible aluminium profiles,” says AlSaie. Another feature of the product is the slim bottom rail, which is only 20 mm in height, allowing the bottom rail track to be embedded in the floor while facilitating easy access for wheel-chair users. This product also allows for corner sliding panels to open at 90 degrees, further enabling designers to open the inside space to the outdoors and creating unobstructed views. 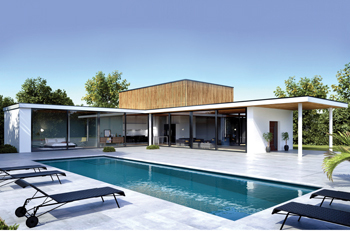 In terms of security, the Galaxie 45TH is supplied with a high-security multi-point locking mechanism that ensures the highest level of protection for very large and tall sliding doors, says AlSaie. Installux has been launching new products every year since 2014. “The pace of innovation has to increase and we need to show we are able to offer innovative and practical solutions,” says AlSaie, adding that the company is focused on mainstream products, not small niche offerings. Installux intends to launch a new façade product in Q1 2018 that is expected to complete its range at the top-end. On the operational side, Installux is rolling out its new front-end portal that will allow customers to place orders online and track their orders in real time. Installux Gulf has a team of around 17 dedicated staff and is involved in projects across the Gulf. It has carried out many landmark projects in the major cities across the Gulf. Among the recent projects executed by the company is Phase One of Ansam, a resort-style residential development by Aldar Properties on Yas Island in Abu Dhabi, UAE. The list of its major projects also includes Emaar Dubai, Burj Residences, The Greens, Dubai Police headquarters in Dubai, most of recent Bin Faqeeh projects in Bahrain, and many developments in Kuwait, Saudi Arabia, and Qatar. Installux Aluminium is a leading French architectural aluminium systems manufacturer and part of an independent French group with a history dating back to 1923. It supplies a wide range of products for the residential and commercial building segments, meeting the highest international standards for performance, energy saving, and durability, AlSaie concludes.